The Scouting program in America has always included uniforms for its members and volunteers to identify members and show they are part of the Boy Scouts of America. Scouts and leaders should wear their uniforms to all patrol meetings, troop meetings, and scout outings. The tan and green Boy Scout uniform is a well-known symbol of American scouting. All scouts in the program wear the same uniform with the major differences being the badges each scout has earned and the troop specific neckerchief. The official dress uniform is commonly referred to as the 'Class A' uniform but, officially known as the "Field Uniform". Most scout troops also have an "activity uniform", referred to as 'Class B' which is often a t-shirt customized just for the troop. Activity uniforms are worn for work projects, sporting activities, and other events in which the dress uniform might get damaged. The first Scout uniform was an impractical copy of the US Army uniform of 1910, which disregarded the far more practical English uniform designed by Baden-Powell. The early BSA uniform had no neckerchief, and Scouts generally wore knickers with leggings and a button-down coat with metal insignia. Scouts and adults both wore their rank insignia on their hats (adults were allowed to earn merit badges and ranks right along with the Scouts). In 1922, the BSA modernized its uniforms to the style we would recognize today. Coats and leggings were dropped, and neckerchiefs were added. Scouts could wear shorts and knee socks in the summer, knickers and knee socks in the winter (trousers replaced knickers in 1944). Until 1948, all Scouts wore campaign ("Smokey the Bear") hats. At that time, the field (overseas) cap (popularized by World War II soldiers) was added. Red berets and baseball-style caps joined the options in 1972. Also in 1972, the BSA changed almost every uniform insignia, making them multi-color, standardizing the shapes, and adding wording to explain what they signify. Brightly colored patches replaced the old black-on-red patrol medallions and the black-on-khaki merit badges. In 1981, fashion designer Oscar de la Renta designed a more attractive Scout uniform (at no charge). The more stylish new uniform maintained a clear Scout identity in its appearance, but used more rugged material and added colored shoulder loops. The most striking change was the switch to a two-color uniform (something many other countries have long had). A tan shirt and dark khaki-green trousers replaced the old medium khaki-green shirt and trousers (which in turn had replaced a medium khaki-brown). In 1989, along with the other changes largely restoring the pre-1972 program, the BSA changed its rank and office insignia so that they more nearly matched the pre-1972 insignia, keeping the wording but replacing the multi-colored backgrounds with backgrounds matching the tan shirt color. In 1990, the BSA added an optional "activity" uniform in addition to the standard field uniform (like the leggings of the 1950s, the expensive activity uniform has not caught on, mainly because Scouts must still own a field uniform for more formal occasions). In the early 1990s, the BSA discontinued its unpopular knee socks, replacing them with shorter khaki socks with a red band at the top. In 1995, responding to complaints (mostly from adults embarrassed about their ugly legs, I suspect), the BSA brought back the knee socks as an option. Today's Scouts and Scouters wear colored shoulder loops to indicate the branch of the Scouting family to which they belong. Cub Scout leaders (and Webelos Scouts who choose to wear the Boy Scout uniform) wear blue loops (other Cub Scouts and Tiger Cubs do not wear loops), Boy Scouts and their leaders wear green, Varsity Scouts and their leaders wear orange, Venturer's and their leaders wear green, District and Council Scouters wear silver, and Regional and National Scouters wear gold. With all these many changes, you know what is easily the most important one in the uniform's 86-year history? It's permanent press! Until the mid 1960s, uniforms were wrinkle-prone cotton or itchy wool. Ironing might last an hour or so (sometimes minutes). Modern, cotton/polyester permanent-press materials are a big improvement. Varsity Scouts who belong to a Varsity team have the option of wearing the standard Boy Scout uniform with orange shoulder loops and Varsity Scout insignia, or they can wear a Varsity Scout T-shirt with non-uniform brown trousers. 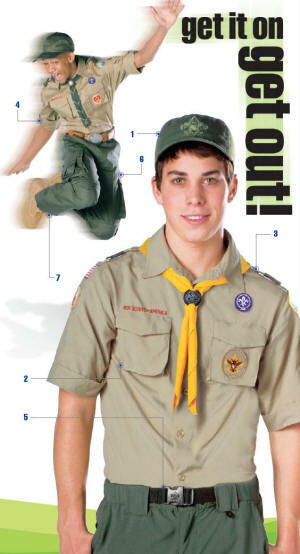 Venture Scouts, and Varsity Scouts in a troop, wear the standard Scout uniform with a "Venture" or "Varsity" strip above the "Boy Scouts of America" strip. The blue Cub Scout uniform has changed little since 1930, except for Webelos Scouts. Many minor changes have occurred at about the same time as similar changes in the Boy Scout uniform, including the switch from knickers to trousers (in 1947, three years after the Boy Scouts) and the switch to permanent press. Oscar de la Renta redesigned the Cub Scout uniform at the same time he redesigned the Boy Scout uniform, but the changes were minor, the most significant being the change from "beanies" to baseball-style caps. The Webelos Cub Scouts of the 1950s and 1960s wore only the Webelos den badge on the standard Cub Scout uniform. In 1967, they were given special Webelos insignia, neckerchief, and hat. Beginning in 1984, Webelos Scouts got the additional option of wearing the standard Boy Scout uniform with Webelos hat, neckerchief, insignia, and blue shoulder loops. The yellow Cub Scout neckerchief was originally worn by all Cub Scouts. In 1967, Webelos Scouts got a special plaid neckerchief. In 1984, the yellow Cub Scout neckerchief became the Wolf Cub Scout neckerchief, and Bear Cub Scouts got their own light blue neckerchief. Tiger Cubs have no official uniform, but members can purchase an iron-on Tiger Cubs logo for parent and boy to put on an orange T-shirt. The early Senior Scouts and Explorer Scouts wore the same uniform as other Scouts. Sea Scouts and Air Scouts had uniforms appropriate to their programs. Explorers of the 1950s had a forest green uniform. Later, a blue blazer "uniform" was allowed, and the forest green uniform was dropped. Today, most posts wear no uniform beyond jeans and a printed T-shirt. Even Sea Explorer ships have total freedom to design their own uniform. Career Awareness Explorers have never had a uniform. The new Venturing program has restored the forest green shirt (now called spruce green) with green shoulder loops and gray shorts or trousers as an optional uniform.